Having a young child at home makes life interesting. Now toss in a few cats and dogs and we have a down right circus! Ellie the Wiener Dog is the star of It’s Hard to be Good. And Ellie reminds me a lot of our dogs and my daughter. In It’s Hard to be Good Ellie is trying to control her impulses. There are so many temptations throughout the home and she finds it really hard to control herself. When the books starts we see Ellie standing in the middle of a disheveled living room. That reminds me so much of my daughter! She’s like a little tornado when she comes into a room. Before I know it our whole living room can be trashed. Then Ellie wander throughout the house looking for something to do and happens into the kitchen where there is a the most delicious aroma coming from the counter. As Ellie gets closer to the counter she realizes the aroma is coming from a sandwich! A yummy, delectable sandwich is just sitting there unattended. No one else is in the kitchen. Ellie starts to saunter closer to the sandwich. She really wants to be good and receive all the positive praise from her family. But that sandwich is just so tempting! She knows it will taste so good. And there’s no one around. Then, there’s foot steps. It’s not long before Ellie’s owners are standing by the sandwich and they notice Ellie standing there too. They see Ellie has not touched the sandwich and they are so happy. In the end Ellie gets a special treat because she was behaved and controlled herself and did the right thing. This is a great book for children. My daughter instantly knew what was the right thing to do and was the wrong thing to do. And she also noticed that when Ellie behaved there were rewards. This would be a wonderful book for someone with preschool age children. It’s a great starting point for helping little ones learn the right from the wrong and there are consequences and rewards for our actions. 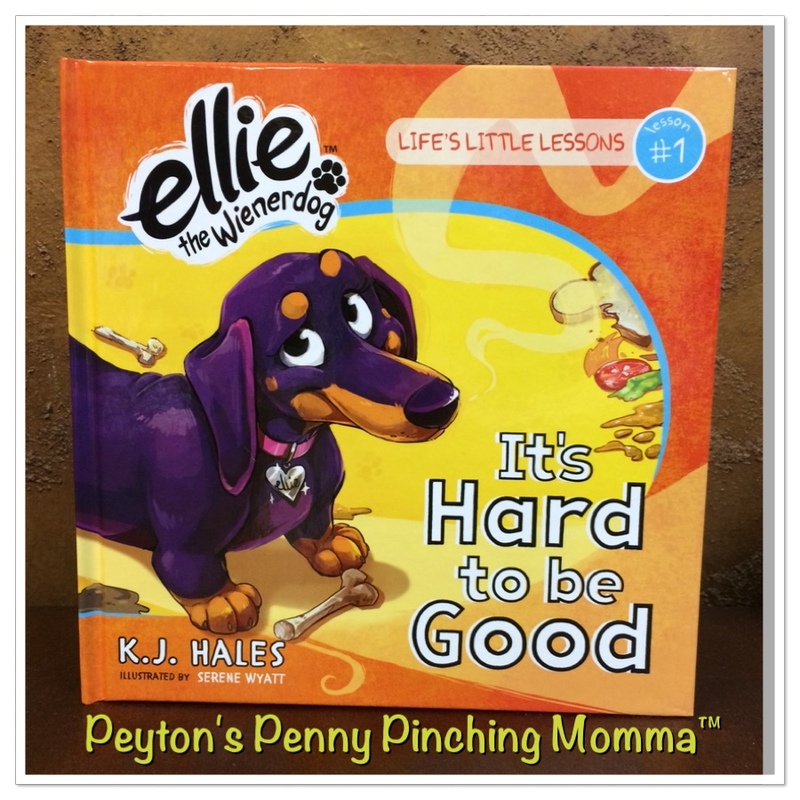 You can purchase your own copy of Ellie the Wienerdog It’s Hard to be Good on Amazon. Connect with K.J.Hales online to keep up on when the next installment in the series of Ellie the Weinerdog will be out.